Senior Honors student JJ Malone with a drone at the University Farm. Senior Jonathon (JJ) Malone came to Illinois State because it reminded him of his hometown of Farmer City. Malone also found that same feeling within the Honors Program. He was welcomed into the program when he was awarded the Presidential Scholarship, the most prestigious scholarship available to incoming freshmen. “I was looking for a tight-knit group within Illinois State and I felt that the Honors community could be one that I fit in really well,” he said. As a student, Malone took advantage of new opportunities to learn. Through an Honors Exploration, Malone was able to investigate compelling concepts beyond traditional college coursework. Honors Explorations offer students the opportunity to discuss unique topics in-depth, such as “small flying robots,” commonly referred to as drones. 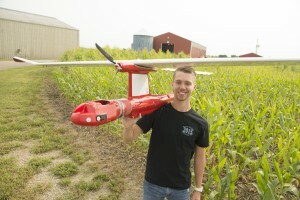 In his Honors Exploration, Malone learned about the impact drones have on farming and agriculture. Malone recommends the Honors Program to all students interested in a greater and more personalized level of learning.